Well, it just so happens that his claim to defence is based on an actual movement known as Freemen-on-the-Land. And they are a bunch of nutters. "Freemen on the land" are a loose group of people who claim that all statute law is contractual, and that such law is applicable only if an individual consents to be governed by it. They believe that they can therefore declare themselves independent of government jurisdiction, holding that the only "true" law is their particular interpretation of the term "common law". Essentially, they are a type of Sovereign Citizen who hold themselves as being unanswerable to the (actual) law. However, Freemen also hold that Maritime or Admiralty Law governs the commercial world. Supposedly they refer to a court as a "ship", the occupants as "passengers" and that anyone leaving are "men overboard". Anyway, you can read some of their fundamental beliefs here. Sadly, despite the claim that these axioms are 'established', there has never been any reported case of a FOTLer ever having a successful day in court. 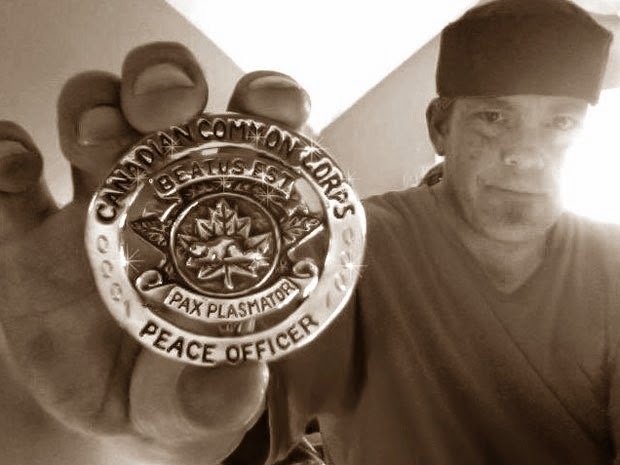 In 2012, Canadian Judge John Rooke released a 185-page decision against FOTLer Dennis Gary Meads, who had tried to argue that "man's law" did not apply to him, and that the judge's jurisdiction was only at sea, not on land. Seems not to have worked out too well for you there, Dennis. Compounding the problem of people actually believing this nonsense, are the 'gurus' peddling this crap - selling books and seminars to people who are desperate and have everything to lose. I had actually come across something very similar a number of years ago but it had been in a different guise, without the trappings of FOTL terminology. That didn't work out well either, they lost their house if I recall correctly. But not until after paying their 'guru' a not inconsequential amount of money for 'advice'. I'll keep my ear to the ground in regards to any future developments regarding Matt of the house of Thompson, but it certainly can't end well for him or his family. This is disturbing, like watching a slow car crash happening.